While everyone in the Republic of Ireland camp has been at pains to pay respect to Saturday’s opponents Gibraltar, there is no getting away from the fact that the only European team below them in the world rankings is San Marino. Nestled between Bangladesh and Brunei Darussalam in 194th position overall, it is a reminder that anything other than three points would be a major setback for Mick McCarthy’s first game back in charge. There are goals to be got, and with Shane Long ruled out earlier this week, it means Maguire will compete with David McGoldrick, Aiden O’Brien and the uncapped James Collins for a starting berth up front. "It’s a great opportunity for the strikers in this camp," he admitted when speaking to RTÉ Sport. "There’s not many caps  between us. If the opportunity arises, I’ll relish it." There were positives taken from the goalless draw with Northern Ireland with last November, even more so for the Preston striker who suffered another hamstring injury. The return wasn't until the New Year, but a return to form took a little bit longer, with the winning goal against Birmingham City at the weekend a timely reminder of his ability in front of goals. He spoke freely about preventative measures he needs to take – extended warm-up and warm-downs on a daily basis – and his failure to train on Monday was part of that considered approach. After three games in a week, he stuck to what he has been doing at Deepdale and spent time in the gym rather than the pitch at the start of the week, something he has implemented effectively for Preston. 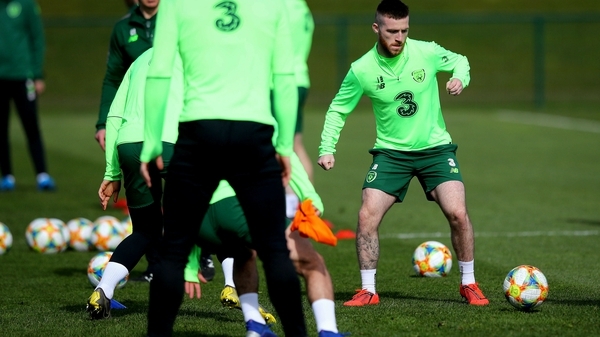 "When I have pulled the Irish jersey on, I haven’t done myself justice"
The former Cork City man is adamant his goal scoring record speaks for itself when he is injury free, but is acutely aware that he has much more to offer Ireland than his start against Turkey and three cameo appearances have illustrated. "When I have pulled the Irish jersey on, I haven’t done myself justice. This time last year [against Turkey], I didn’t play well at all or up up to the standards I set myself. "Given the opportunity, I think I can bring goals. These are the types of games as a striker where you will be given opportunities to put the ball in the back of the net." The presence of record goal scorer Robbie Keane in the backroom team is significant for the 24-year-old as he looks to plunder his first goal. Maguire was just four when the prolific striker claimed his first senior goal and would add a further 67 before hanging up his boots in 2016. The Preston front man only met Keane for the first time on Sunday when the squad met up, but the impact has been quick. "It’s an amazing feeling," he responded when asked what it was like to work with the former Spurs and Liverpool striker. "Just chatting to him, he brings that awe about him. You want to learn from him straight away. "Hopefully in the next couple of games I can kick on my international career"
"Even in the last couple of days, giving tips here and there. I’ve no doubt that even in the space of 10 days I’ll go from strength to strength and kick on as a player. "Hopefully in the next couple of games I can kick on my international career." Follow Gibraltar v Republic of Ireland (kick-off 5pm) with our live blog on RTÉ Sport Online or the RTÉ News Now app, watch live on RTÉ2 or listen live on RTÉ Radio 1's Saturday Sport.